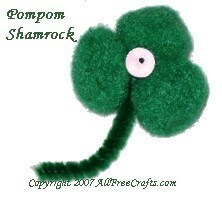 This pompom shamrock is easy to make as a St. Patrick’s Day party favor, fridgie, or pin. It’s also a great St. Patrick’s art project for home schoolers, classrooms or youth groups. 1. Bend up the end of a 2&frac14″ piece of green chenille stem then curve the remainder of the chenille stem slightly to form a stem shape. 2. Apply a small amount of tacky glue all around the bent end of the stem. 3. Following the photo, push the three pompoms into place around the glue, pinching them together with your fingers until they hold in place. You may also need to put a small amount of glue in between the pompoms to make them more secure. 4. Slide the pearl bead onto the tip of the chenille stem, in the middle of the pompoms. 5. If you wish to use the shamrock as a fridgie, glue a fridge magnet in place on the back. To make a pin to wear on St. Patrick’s Day, just glue on a pin back.